A New York based designer had a client with a special need. They wanted the Breuer chair with arms that were upholstered but couldn’t find it anywhere. Thankfully they found us and all they did was ask. “They are perfect” the client said as they approved the new Breuer arm chairs for their newly decorated dinning room. Welcome to the new Seats and Stools blog. 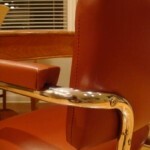 We plan to keep you up to date on all things related to the classic Breuer chairs and replacement chairs and replacement chair parts. Be sure to check back often for our latest news and chair information.